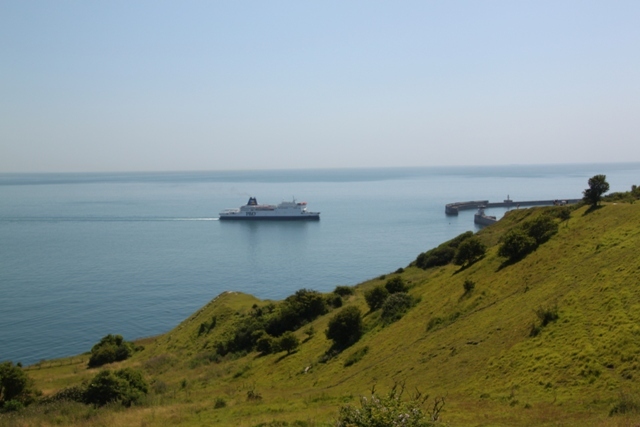 Dover is no top tourist hot spot, more the kind of place people drive through en route to the ferry to go someplace else. We decided to buck the trend and stay a couple of nights to explore a little before our ferry crossing. 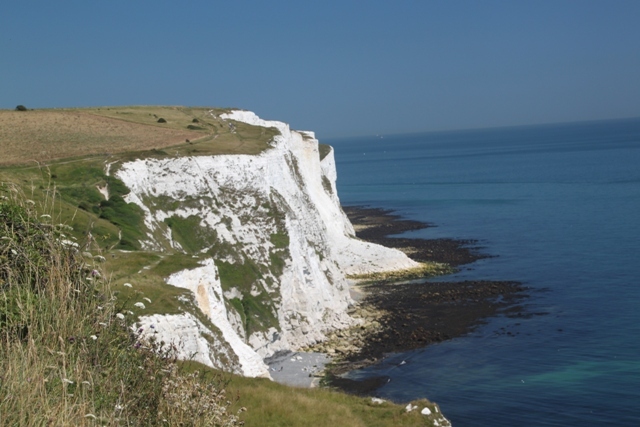 Top of my list was the famous white cliffs – where we headed as soon as we arrived. Our goal was to hike to South Foreland lighthouse, up and back along the cliffs, four miles in total, hopefully getting a closer look at the chalky wonders on the way. A National Trust area, we found a big car park and visitor centre with superb cafe and tearoom. Son took the opportunity to offload some money (burning a hole in his pocket) in the gift shop, then armed with water, hats and sun-cream we set off in search of the coastal path. 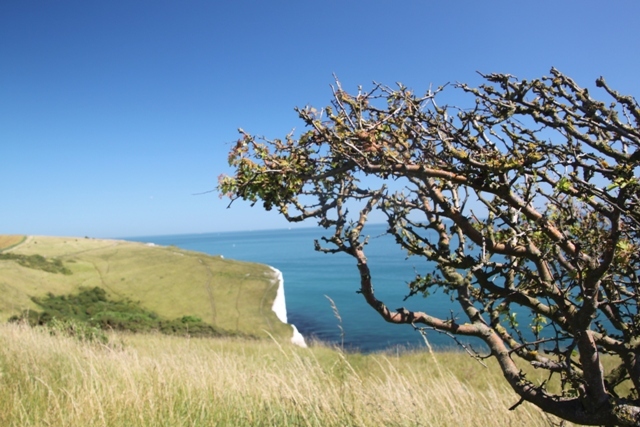 This is definitely the best place to get great close-ups of the cliffs and the chalk grassland that is home to unusual plants, insects and lots of butterflies. Far reaching views over the English Channel towards the French coast too – on this bright, clear day we could easily see chimneys in France in the distance. The cliffs are eroded by about five centimetres every year, although in winter several tonnes can fall. The battering of the sea means they stay white – were it not for this they would be covered in green vegetation. Apparently there are Exmoor ponies here which graze the grass and keep it short and manageable – we didn’t spot any. 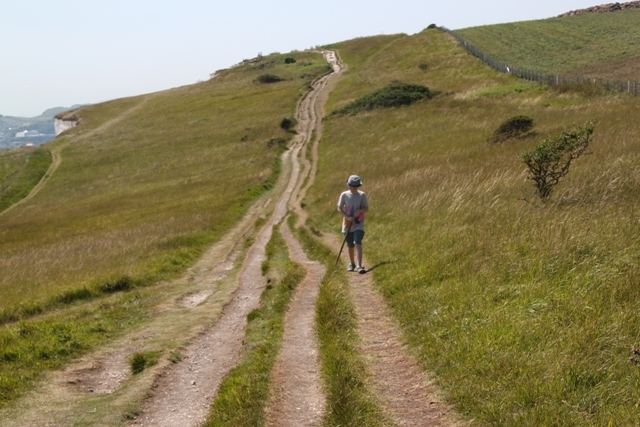 As we left Dover behind the first part of the path became super narrow with a sheer drop to the right. Not for vertigo sufferers, I however was so focussed on keeping Son away from the edge that vertigo was the last thing on my mind. After a short way it widened then we were on the cliffs proper and all could breathe a sigh of relief. Plenty of space to spread out and no danger of having to go too near the crumbling cliff edge. Great views of the port and a reminder this is a working and industrial place. 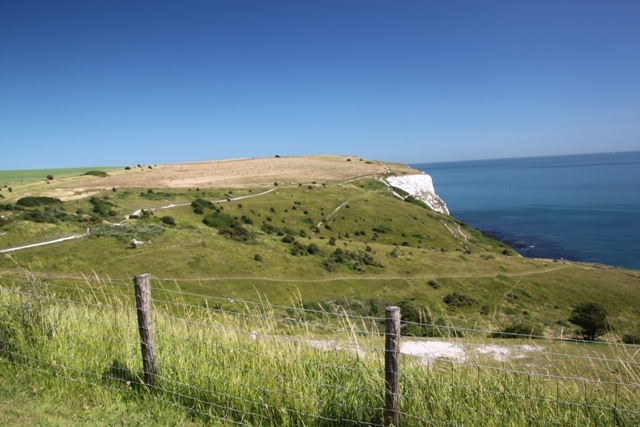 However in about five minutes we found ourselves in a rural idyll – just glorious where the chalk cliffs meet the English Channel with superb views of the French coast. 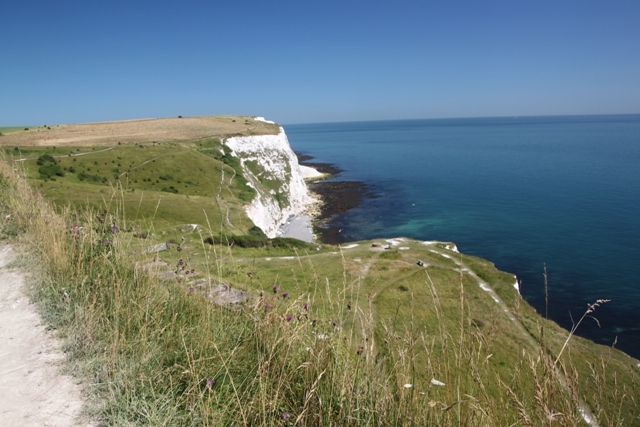 The cliff top is designated an Area of Outstanding Natural Beauty and a Site of Special Scientific Interest due to the flora and insect life. The terrain was fairly uneven and undulating, the tracks were rough but there were just a few steep slopes to climb. Son found many things to catch his interest so our walk took probably a fair bit longer than that of most other people. 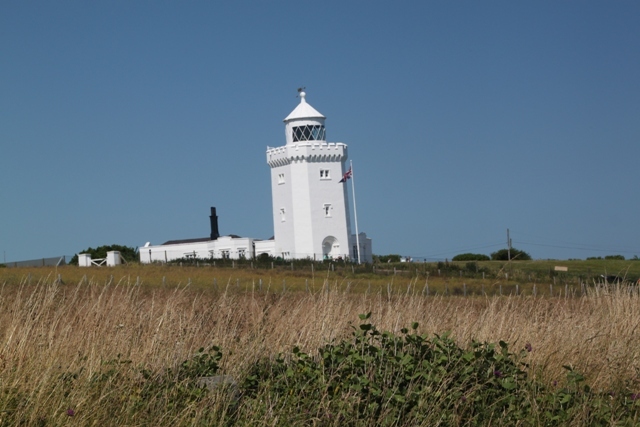 South Foreland lighthouse, at the end of the path and up a steep hill had a wonderful 1940’s style tea room with music playing and the best cupcakes I have ever tasted. Washed down with icy cold lemonade they were just the thing to restore flagging energy levels. We got tickets for the lighthouse – National Trust members go free – and then did the guided tour. A wonderfully enthusiastic guide told us all the history and took us right to the top. It was built in 1843 but there has been a lighthouse on this spot for over 350 years – the infamous Goodwin Sands are nearby. This lighthouse was decommissioned in 1998. Michael Faraday came to oversee it being the first lighthouse lit by electricity, it was also the site of the first ever international radio broadcast. We were shown how the light mechanism works – Son was intrigued by that, Husband and I were intrigued by the wonderful views. Back down to the cliff path, back across the fields and cliffs to our starting point with more of those wonderful views to keep us going as we retraced our steps. There are endless cliches about this place, you feel somehow like you know the White Cliffs even if you’ve never been there, the reality definitely does not disappoint. We’ve been to the cliffs 4 years agon when we arrived with the Ferry. But it was a windy and rainy welcome… Thank God I could take some pictures whe we left 2 weeks later with the sun shining ot the cliffs. It was impressive anyway standing up there. Great pics, Joy! I’m so glad it wasn’t windy and rainy the day we walked the cliff top Erika – that would have been a completely different blog post!! We were blessed with sunshine and that makes all the difference – glad you got to see them in a better light when you left!! Enjoy your weekend, hope it is sun filled too. It looks like an awsome weekend indeed. Have a great time too, Joy! 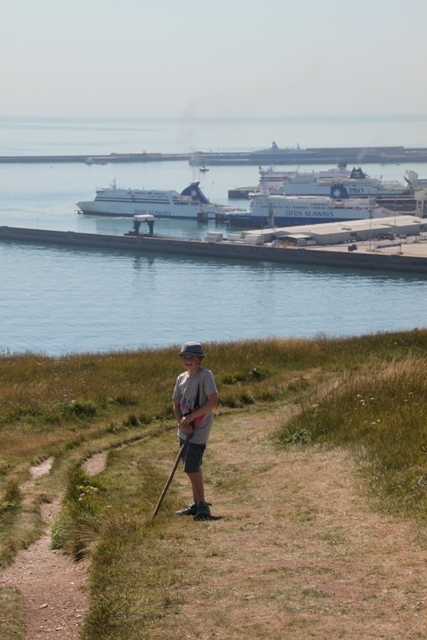 That sounds interesting – will note those places, we had such a good day here would like to see it from the other side of the Channel – also fossil collecting would be a bit hit with our son for sure. I think it is probably mostly chilly here too, we lucked out with the weather that day, if anything it was a bit too hot!! Can you imagine that in England…..
Beautiful photos of the cliffs! Looks like you had awesome weather as well! The weather was amazing – next day it was grey and wet so we definitely had luck on our side! Well, that looks lovely – and a two-tearoom walk to boot. Result! You can’t beat a tearoom at the beginning and end of a good walk Anabel!! Perfect day out. The cliffs are spectacular and the views over to France are incredible too. It really was – a walk with a wow for sure! At last the sunshine has arrived in the UK, really enjoying your posts in England. Yes, very long overdue sunshine, hopefully it sticks around for a long time!! Have a great weekend. This is a famous place and slightly mysterious for me. Remarkable and delightfully photographed. I’d have liked to try the tea place from the 1940s. How was that chalk formed? The tearoom was wonderful – in fact the whole walk was a great experience. I think the chalk is actually limestone that built up over millions of years gradually but don’t quote me on that!! Sounds like a great time! Thanks for sharing! 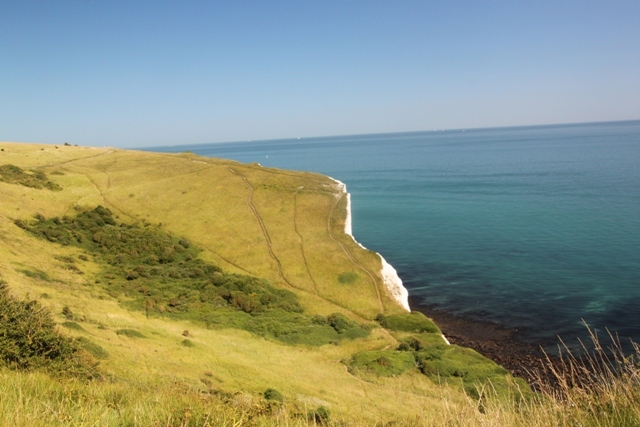 That song was in my head the whole time during this walk Diana – in fact every time I look at the white cliffs I think of it!! Awwww….I know! I guess that period must have been VERY difficult, but still very ….I don’t know….romantic. Also a period of a lot of hope – after the war was over. Love that song. Anyway…again…enjoying your posts on this area. It is a spectacular walk Rosemary – although if you don’t like heights maybe not the place to go!! We enjoyed the views and the fact it was so sunny definitely helped with the whole experience – well that and those cupcakes!! Hope your weekend is a great one too. Yes I shall enjoy the view from your lovely photos where the height can’t bother me! It seems as though you can see forever from these photos. The clear skies and bright conditions really did make it feel like that for sure! Superb writing, so natural and the photos grabbed my attention. I would have enjoyed this day of fresh air and panoramic views. Thank you so much! This was a wonderful day out, the cliffs and the views over the sea were incredible, the lighthouse and its history just the icing on the cake. A walk with a wow. You had me at the title…interesting read :). Thank you!! It was a great walk – plenty of fresh air and spectacular views and a lighthouse at the end – just perfect. 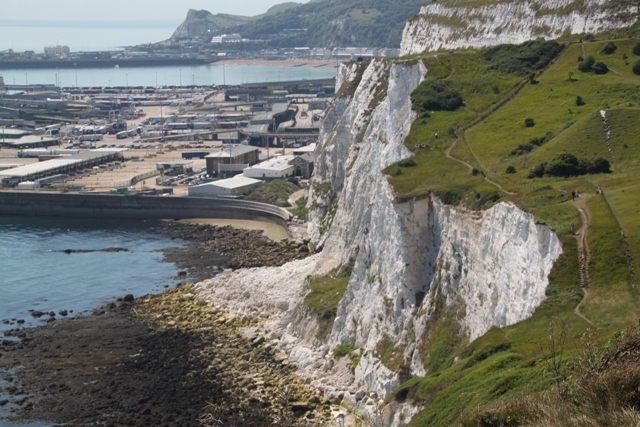 I’ve always been curious about the white cliffs of Dover. I’m surprised that more people don’t take the time to visit….but I’m glad that you visited and shared. Does this mean we’re going to see some posts about France soon? 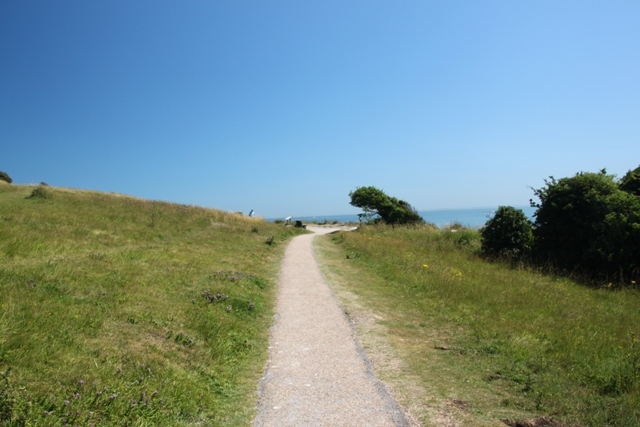 It’s a stunning walk – views are amazing and yet it was surprisingly deserted, all the better for us though!! You’re nearly right Melissa – not France but close – Belgium!! Grat pics and views,Joy. Why is this not more of a tourist destination? It looks interesting the sights appear to be an attraction along with the history. Is there just not enough there to attract people? Have a great weekend and thanks again for the tour. Not sure at all George – we saw plenty of people at the tea rooms either side of the walk, not so many actually hiking the cliff tops yet those were the best views for sure. Anyway, all the better for us to have it to ourselves!! Enjoy your weekend too. This is so funny, the other day I said to hubby that I’d really like to go to the White Cliffs, so glad you’ve written about it. The views looks wonderful and I will remember the cup cakes in the tea room are amazing! Looks like you had a gorgeous day for it. I felt like that too Kamila – saw pictures of it so many times but the reality is even better! 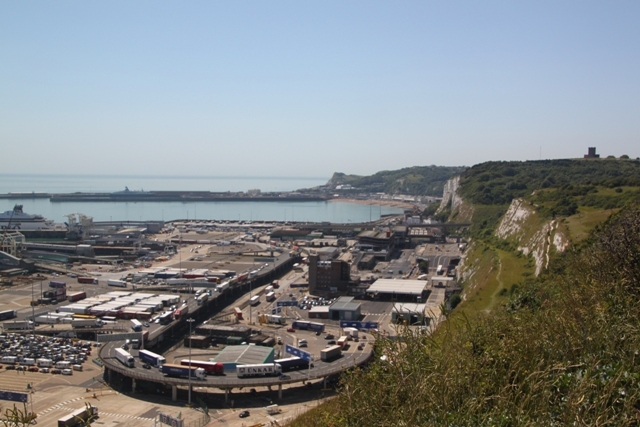 I wasn’t there for long, but Dover was one of my fave places in England when I visited in 2000. We had such a great day at the cliffs then an equally superb time at Dover Castle. Shame it’s overlooked by a lot of people, there is much to see and do here. Fabulous photos. 😊. I’ve always wanted to see the white cliffs of Dover. I’ve had one trip to England but was only there ten days. I saw heaps but maybe next time I’ll go to Dover. It looks especially wonderful. Lovely lighthouse too. Walking over the cliffs was an amazing way to see them properly Maria – the lighthouse was the icing on the cake at the end of the walk too!! Love it so beautiful – I hope I will be able to visit soon so peaceful! Great Photos! It is a superb walk – amazing views and we had it all to ourselves! Definitely recommend. I’ve always wanted to see these cliffs and I’m glad that you went there and got such beautiful pictures! Can a person get there by train? Thanks! They’re well worth a visit Meg – just as spectacular in reality as you would imagine. We drove there and had our car the whole time, however according to the National Trust website you can take the train – from St Pancras in London and then the station is 2.5 miles from the cliffs. Hope you get to see them sometime!